Enjoy your own very own mountain retreat just 20 minutes from historic Julian, Ca. in this gorgeous eco-friendly property. This 4 bedroom 2 bathroom house sits on 8 acres of horse property complete with riding trails, paddocks, fire ring, and more! The beautiful drive onto the property leads you past the gate house and hitching post to the main house, which comfortably sleeps 8. With full kitchen, living room, dining room, 4 bedrooms, and 2 full bathrooms you'll have all the comforts of home. Beautifully adorned with new furnishings, hardwood floors, and working wood-burning fireplace, this home is the perfect destination for a short getaway or extended vacation. Inside the home, you'll find many amenities, including full kitchen, wifi, satellite TV, DVD player, and an Xbox with lots of games. The raised deck just off the living room sports a gas fire ring, a massive 6 burner gas grill, Adirondack chairs, and collapsible shade umbrella, a great place to entertain while you watch the wildlife in the wooded meadows below. Guests with horses will enjoy our facilities, including 2 paddocks, 2 riding rings, a barn (barns opens in January 2018) with two indoor stalls (with runs), and tack room. The yard around the house is completely fenced in and perfect for pets! All pets are welcome! The property is 12 minutes to Cuyamaca lake and cafe where the fishing is great! With trails on and off the property, this is the perfect vacation for hiking, riding, or just relaxing! Come visit this story book property for a once in a lifetime experience. Beautiful surroundings, peaceful setting, comfortable and clean accommodations........loved it! My family and I had such a wonderful 3 days at Sandy Creek Ranch. Driving into the ranch was an experience into itself.......the view was magnificent! Once there we basked in the warmth of the fireplace and played board games that were readily available. The next day we hiked in the area and saw deer and lots of turkeys. That evening it snowed for several hours, and we totally enjoyed watching the snow fall out of a large living room window while my grandkids and their poodle ran around in the snow, something they had never experienced before. The following day they went sledding down the gentle hills around the house. We all had a very relaxing and fun-filled time at the ranch! Highly recommend this place to anyone wanting to get away from the city. The owner provided amazing customer service. The house has everything you could want or need. The house was clean and well appointed. The property was fun to explore. We saw deer running through the property and a large flock of wild turkeys. We look forward to staying here again. Our family spent Thanksgiving week here and we loved it! The house was beautiful and spotless. The views were incredible. It was a very relaxing weekend, just what we needed. There were games to play, movies to watch, and a fire pit outside. I’ve stayed in a lot of air b&bs and Ross was hands down the best host I’ve ever had. He’s just a good person who was so helpful the entire time. I would love to come back. Thank you Ross again for opening your beautiful home and being such a great host to us. Cheers!! The house and property are wonderful. We had plenty of space for 4 adults and 3 kids plus 2 dogs. Our experience was great from start to finish. The property is off of the grid so when high winds caused power outages we were not affected. The owners were very nice and accommodating. 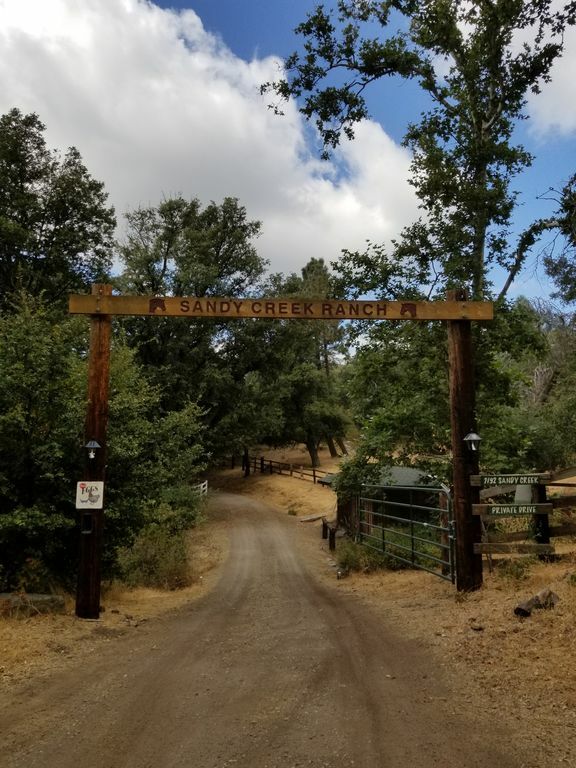 I would love to make an annual trip to beautiful Sandy Creek Ranch. Our family had a great time. It's a beautiful ranch and very private without being isolated. It boasts the oldest live oak in the Lagunas, which you can admire from the deck. The owner was very friendly, informative and reachable at any time. He took great care of us. Spacious, off the grid accommodations, but with the creature comforts of WiFi , DISH tv, etc. Beautiful views from the upper deck where we saw several deer, rabbits and squirrels. About a 20 minute drive into Julian, but we preferred to hang out at the ranch! Ask about our "Stay 3, get 1 free" special offer!